(Opinion) Since his passing Saturday afternoon, the late Arizona Senator John McCain has been the subject of numerous eulogies, the vast majority of which have sought to characterize him as “one of our country’s greatest heroes,” an “unparalleled example of human decency,” and “a patriot of heart,” among other encomiums. However, for those well aware of McCain’s overwhelmingly negative impact on American foreign policy through his constant promotion of American imperialism and “humanitarian” regime-change wars, his death has hardly inspired such fawning memorials. Indeed, some notable critics have used McCain’s passing as a call to arms to resist imperialism, while others have used it as reason to celebrate given that one of Washington’s most notorious warmongers can no longer promote the destruction of entire nations and the mass death of civilians the world over. Overwhelmingly, these critics of McCain’s legacy have rejected the notion that he is the “American hero” that so many voices across the American political spectrum, from Lindsey Graham to Bernie Sanders, have claimed. Yet, outright rejecting the label of McCain as an “American hero” should be avoided by critics of McCain and the imperialist foreign policy and fascist corporate welfare domestic policy that he so often stood for. This is because, to put it simply, if you define America as the U.S. government, which has been molded by and built on decades of perpetual war for the express benefit of monolithic corporations, then McCain was certainly an “American hero” as it was this system that he served all of his public life, through his cancer treatment and up until the very moment of his death. 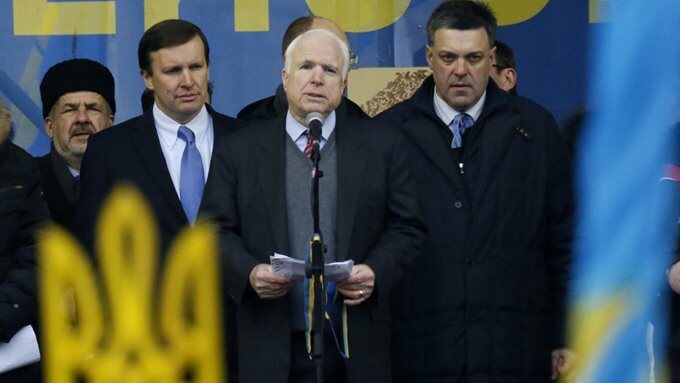 McCain also proved on several occasions that he was always willing to stoop to new lows in his support of U.S. militarism and empire, whether it was standing on stage with Neo-Nazis in Ukraine or taking candid photos with terrorists in Syria. If those eulogizing him are to believed, such behavior makes one “a lion” of the U.S. Senate and an American political icon. In terms of his actions, McCain frequently embodied the worst of the U.S. government and championed many of its most unpopular policies, all while gaining notoriety decades ago as one of the Senate’s most corrupt and racist members. Indeed, many of McCain’s most hawkish positions have been portrayed as reflecting his “dedication to America’s global leadership” — i.e., America’s global hegemony — or his “steadfast opposition to despots,” though not the despots of Saudi Arabia or several other dictatorships that the U.S. continues to fund and arm. Yet, it is the portrayal of McCain’s support of war and regime change as “human rights” advocacy and as “championing democracy” that is most absurd of all. All of the wars McCain has supportedhave hardly resulted in improved human-rights situations or even democratic outcomes — Libya and Ukraine are two clear examples — and McCain was undeniably aware of whom he was really supporting and what the actual motivations of those conflicts were. However, the rehabilitation of McCain’s warmongering — through his own words and those of others — mirrors the elevator speech used by the U.S. government itself to justify those very same wars and interventions, which are invariably cast as being motivated by “human rights,” standing against “despots,” and supporting “democracy” around the world. Attempts to deify McCain as an “American hero” by using the same platitudes used to justify the U.S.’ obscene war mongering and meddling abroad speak volumes about the American political scene. For one thing, it makes it clear that even the most right-wing, war-mongering members of Congress are now willingly embraced by the American “left” if they get into public disagreements with Donald Trump and become members of the so-called “resistance” of centrists against “Trumpism.” McCain, along with similar neo-conservative figures like Bill Kristol and Max Boot, have been major beneficiaries of this trend. Beyond the trolling-of-Trump effect, even “anti-war,” “progressive” politicians like Bernie Sanders and “rising star” Alexandria Ocasio-Cortez have shown that they too are dependent on the current U.S. government system of perpetual warfare and corporate power through their eulogies of John McCain. Sanders said McCain will be missed “by all Americans who respect integrity and independence” while Ocasio-Cortez claimed she “learned a lot about the power of humanity in government” through McCain’s example. For that reason, U.S. politicians, left and right, hide behind nebulous and vague ideals of “human rights” and American “global leadership” when supporting the violent destruction of human life and independent “rogue” governments that the system requires to sustain itself. 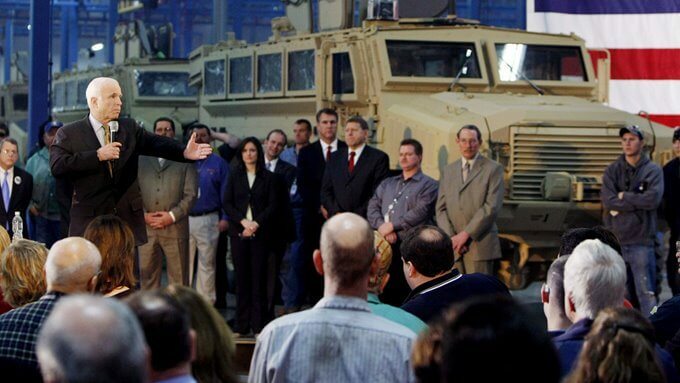 As Sanders’ and Ocasio-Cortez’s praises of McCain show, the unfortunate reality is that even “anti-war” politicians are beholden to a system so utterly dependent on war that it requires a new major war every four years in order to maintain economic growth. To this “permanent war economy,” John McCain is a “hero,” as he supported it at every turn, no matter how low he had to sink to do so. His allegiance was to the very system that leeches money away from American workers to the pockets of billionaires and multinational corporations and that sustains itself off the spilled blood of innocents killed by an insatiable war machine. Indeed, McCain was only a “maverick” in the sense that he supported this system even when other politicians were hesitant to do so — for fear that supporting certain wars or certain instances of corporate welfare would expose their actual commitment to U.S. empire and the elite power structure over their feigned commitment to “American ideals” and the American people. In this sense, the eulogies that call McCain a “hero” are honest, as such eulogies have been delivered only by those who, like McCain himself, support this system of perpetual war and corporate welfare once known as the United States government. Though these politicians, pundits and public figures may quarrel over other, minor issues from time to time, they are united in their support of a toxic system that lives off of and profits from immoral wars and the exploitation of the American people. The innumerable praises lavished upon McCain’s blood-soaked legacy should thus be considered endorsements of this system, as one can only call McCain a “hero” if one embraces the status quo of American empire and the dishonest moral justifications used to disguise the true motivations of its policies. About the Author: Whitney Webb is a staff writer for MintPress News and a contributor to Ben Swann’s Truth in Media. Her work has appeared on Global Research, the Ron Paul Institute and 21st Century Wire, among others. She has also made radio and TV appearances on RT and Sputnik. She currently lives with her family in southern Chile. This article (What Calling John McCain a “Hero” Says About America’s Worship of War) was originally created and published by MintPress News and is republished here with permission and with attribution to author Whitney Webb and MintPress News. Scarier Than John Bolton? Think of Nikki Haley for President!